Every set of points which has a passenger move over them, must be track locked as discussed in 9.17. Another way of achieving this is to prevent the controlling point lever from moving. 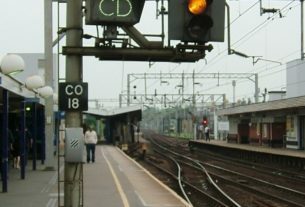 In many situations, both methods are used to prevent the points from moving when a train is upon them thereby making doubly sure that the points cannot move at all. 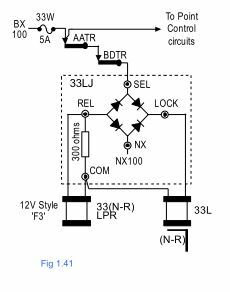 Because the points must be track circuited throughout their entire length, the corresponding track relay contact can then be used to control the point lever lock circuit. 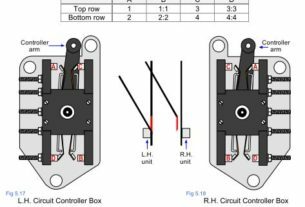 In the case of double ended points both track relay contacts are used in the common lever lock circuit. All point levers are fitted with an electric lever lock. When this lock is energised (up) the point lever is free to move. Conversely when the lock is de-energised (down) the point lever is held in either the Normal or Reverse position thereby preventing the lever from moving and possibly energising the point control circuits. Fig 1.41 shows a lever lock circuit. This is also fed from the main 33W fuse over the front contacts of all the point locking tracks. 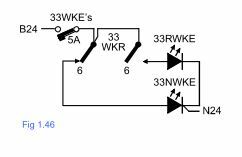 A bridge rectifier (33LJ) changes the supply current from AC to DC to ensure correct operation of the DC lock solenoid, 33L. Also shown is an LPR. This relay is used in the non-vital lever operation circuits to detect whether the lock is energised before moving the lever. The LPR is a 12V DC style ‘F3’ relay and is wired in series with the lever lock. A 300 Ω resistor is wired in parallel with its coil to provide the correct voltage to the relay. The bridge rectifier and resistor are mounted on a single board which is normally located on the top of the same rack as the LPR. Connection to the board is via terminals labelled SEL, LOCK, REL, COM and NX. Maintainer’s diagrams in IMRs are provided with indications showing the position of all the sets of points controlled from that room. 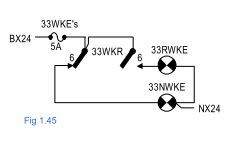 Old style circuit :- In older IMRs, these are normally two 24V a.c lamps labelled N and R which are switched over contact number 6 on the WKR. A typical circuit is shown in Fig 1.45. New style circuit :- In modern IMRs the lamps have been replaced by light emitting diodes. The LEDs, which require approximately 2V, have integral resistors to drop the voltage down from the 24V d.c supply. A typical circuit is shown in Fig 1.46.